In early May the American Polo team will host Italy in the The Land Rover America’s Polo Cup held at Historic Morven Park in Leesburg, Virginia. As part of the event, the Virginia Wine Lover Magazine will coordinate a wine competition among Virginia wineries which will occur Wednesday, April 9th at the Virginia Beach Resort Hotel & Conference Center. Eight judges will evaluate the wines based on Appearance/Clarity, Color, Aroma/Bouquet, Total acidity, Sweetness, Body, Flavor, Bitterness, Astringency, and Overall quality. The winners will be announced Friday May 9th at the The Land Rover America’s Polo Cup Black Tie Cocktail Party. This "party" will also include a Fashion Show hosted by Paul Wharton and a culinary challenge between each country’s best chefs. The evening concludes with a live concert from the always entertaining Gipsy Kings. On Saturday May 10th the festivities include military demonstrations, followed by a competitive polo match featuring the Italy challenging the United States for the America’s Polo Cup. In the evening expect live performances by Huey Lewis & the News, the Gipsy Kings, and Italian sensation Vittorio Grigolo. Proceeds from the America’s Cup of Polo will benefit the Journey for the Cure Foundation, a not for profit public charity foundation. Tickets for both Friday and Saturday's events are available here. Over the next month we will post interviews with officials coordinating the wine challenge as well as a preview of the initial release of the Virginia Wine Lover Magazine. One of the most overlooked venues to listen to live music is usually in one's backyard; there is an increasing trend for wineries to include live music in their events, whether through annual concert series, Sunday jazz parties, or incorporated into a grape stomp. The wineries book national acts or promote local artists - either way when you combine good wine and good music - you can't go wrong. Close to our headquarters, Tarara Vineyard & Winery in Leesburg Virginia hosts a Summer Concert Series from July through September. This summer they've booked rising local artist Shane Hines and the Trance as well as Derek James, Melanie Mason, the Grandsons, and the Junkyard Saints. What a schedule. Across the river in Mt. Airy Maryland, Linganore Wine Cellars hosts annual Caribbean, Jazz, Blues, and Reggae festivals. Our favorite is usually the Blues festival where for the past two years we've seen the Nighthawks and The Kelly Bell Band on the same stage. Following Route 15 north into Pennsylvania, Adams County Winery, near Gettysburg, hosts free Saturday afternoon concerts and they've been able to book the Skyla Burrell Blues Band twice this summer. And "neighboring" Mount Hope Estate & Winery hosts a few unique festivals this spring where you can hear Gandalf Murphy & the Slambovian Circus of Dreams, Hot Buttered Rum, Gaelic Storm, and Enter the Haggis. These are just a few examples out of the numerous wineries who host music within an hour 1/2 drive from Washington D.C. There are other excellent examples in other states. La Belle Amie Vineyard in North Myrtle Beach South Carolina provides a music festival every other Saturday throughout the year. In Boonville North Carolina, RagApple Lassie Vineyards hosts a Saturday Shindig. Then there's Lakeridge Winery in Clermont, Florida; Grande River Vineyards in Palisade, Colorado; Holy-Field Vineyard & Winery near Kansas City; Haak Vineyards & Winery in Santa Fe, Texas and Warwick Valley Winery in Warwick, New York. Perhaps the best lineup is at California's The Mountain Winery - located in Saratoga - near San Jose. They have weekly concerts with mostly well known artists. Wine-Compass.com and MyJoog.com have many of these events posted - just take a look there or the winery's websites. Over the past few weeks I've been visiting several Northern Virginia wine stores to inform them of the new Virginia Wine Lover Magazine, that will debut in May. These visits introduced me to a new world of wine events, the weekend public tasting. Each wine shop had different versions, perhaps a distributer was pouring various wines from a region or just a sample of wines from their inventory. Or representatives from a winery would pour their wines. No matter the forum, the opportunity is present to sample wines that you would not normally be able to taste. And since almost every town has a boutique wine store, the opportunities are plentiful. In my hometown of Vienna, Virginia there are four wine shops - all that provide weekend tastings. In nearby McLean Virginia, there are two stores which I visited today. Ceciles Finewine was hosting Chalie Hoppes, owner and winemaker from Washington's Fidelitas wines. Fidelitas makes a wide array of Bordeaux styled wines from grapes sourced from several preeminent vineyards throughout Washington. Today Mr. Hoppes was pouring their 2005 Cabernet Sauvignon Columbia Valley, 2005 Syrah Columbia Valley, and 2006 Semillon Columbia Valley. These were three good wines that I normally would have looked at, but maybe not purchased if not for the tasting opportunity. The Syrah was my favorite; it had a jammy cherry flavor with a smooth, slightly spicy finish. However, I returned home with the Semillon since we had a low inventory of food friendly white wines. A short distance away, The Vineyard of McLean VA was hosting the wine distributer Nice Legs for their Saturday tasting. They were also pouring wines from the Columbia Valley, and also from Oregon's Willamette Valley and Sonoma. The 2004 Sonoma Coast Vineyards Pinot Noir was awesome; silky smooth without the overly fruity flavor and high alcohol that my Oregon friends warn about California Pinots. But at $60, you pay for quality. My next favorite was the 2005 Russell Creek Tributary Red a blend of Cabernet Sauvigon and Merlot. This wine has cherry flavors with a slight spicy finish - but soft tannins that produce a smooth tail. At $22, this wine falls within my price range. Wine-Compass.com has a listing of wine retailers by state. To search for wine events, click the Wine Map tab, click a state on the map, then click the Festivals & Events button. To view the retailers click the Retailers button. If your favorite wine shop is not listed, just send us its name, address, and url. In the coming months we plan on attending a few wine shop events including Klaus Wittauer and "Everything You Always Wanted to Know About Austrian Wines, But Were Afraid to Ask" on May 1st at Out of Site Wines and Ceciles Finewine's Spring Wine Festival May 17th and 18th. See you there. We are always looking for the unusual wine and we recently noticed a bottle of Mediterranean Cellars 2004 Rechina in our cellar. We had visited this local northern Virginia winery about 2 years ago (see Compass Tours) and the bottle had finally resurfaced. This wine is made in the Greek wine making tradition inherited by the Papadopoulos family. Before the use of barrels, wine was stored in containers which quickly became oxidized. Around the 13th century B.C., the Greeks discovered that adding a trace of resin from Aleppo pine trees preserved the wine as well as providing a unique piney flavor. Even after the use of barrels became routine, which also preserved the wine, the resin was still added to some Greek wines because the flavor was so popular. This tradition continues today. According to Mr. Papadopoulos, his version is similar to the Greek style - but has been Americanized - meaning it is milder and smoother than the current counterparts. However the piney flavor is still apparent which makes this a very versatile wine. The piney flavor is not oaky or buttery as an oaked Chardonnay; the initial flavor is similar to taking a whiff of pine sol, but the pine aroma and flavor mellows in the mouth. I tried it in many circumstances and in all cases I loved it. It works well alone - as a sipping wine - think of a light scotch. I drank it with beef and the pine flavor melted into the meat. Think of it as a white wine drinker's red wine. It also complimented mesquite chicken where the spiciness from the marinade blended harmoniously with the wine. I even liked it with Belmont Peanuts. There is no doubt that we will be making another trip out to Mediterranean Cellars to resupply. And the next will be a comparative tasting of this winery's Americanized style and the authenticate Greek Retsina wine. We were notified today that the producers of NBC's Nanny 911, Hell’s Kitchen and Kitchen Nightmares are planning a new restaurant competition show. They are looking for "outgoing and enthusiastic" pairs (couples, relatives, friends, co-workers, etc.) who have the "drive, determination and dream to open their own restaurant". If you are interested there is an open call on Saturday, March 22nd, at the Sofitel Lafayette Square from 10am - 4pm. For more information E-mail or call: NBCteamsDC@yahoo.com or (646) 961-3991. On Saturday and Sunday, March 1st and 2nd we attended the 2008 Washington D.C. Wine & Food Festival held at the Ronald Reagan Int’l Trade Building. The organizers of this event do a tremendous job presenting wines from across the globe. In the past three years we have tasting wines from Napa, Sonoma, Lodi, Paso Robles, South America, South Africa, the Finger Lakes, Long Island, and Virginia; and wineries from these regions were again represented. The organizers also featured two local wine trails, the Loudoun County Wine Trail and Frederick Wine Trail, as well as wines from Cote du Rhone and Oregon. There were also several complimentary food and wine seminars in the tasting areas as well as private seminars at reasonable prices. On Sunday I took the A Beginner's Blind Tasting with the Master/Master seminar presented by Doug Frost. But on Saturday, the day was spent sampling the wines, beers, and spirits. Upon entering the festival, we preceded immediately to the Oregon Wine Board section where we were able to sample excellent Pinot Noirs and Rieslings from this area. We found it odd that the same region excelled in making a Burgundy wine (Pinot Noir) and Alsace\German wines in Riesling. In fact, some of our favorites were Anne Amie Vineyards soon to be released Muller Thurgau, Sokol Blosser Vineyards Evolution (9 varietals including Riesling, Muller Thurgau, Gewurztraminer, and Sylvaner) and Amity Vineyards’ 2002 Late Harvest Riesling – a true 100% botrytis wine. But Pinot Noir was what we were interested in and each of the nine Oregon wineries had excellent samples, with the 2006 vintages being outstanding. It was also interested that the wines came from several appellations - the Willamette Valley, the Eola Amity Hills, the Chehalem Mountains, Carlton, Dundee Hills – and since I hadn’t taking Doug Frost’s couse yet- I could not discern a difference in terrior. It’s difficult to designate one over the others without doing justice to the rest, but one unique bottle was Willamette Valley Vineyards’ Whole Cluster Fermented Pinot Noir. This wine is fruitier than the other’s and I can see serving chilled in the summer. A second unique wine is Coelho Winery’s 2006 Divertimento Pinot Noir Rosé - another nice summer wine. We also had several good conversations with Jim Bernau, founder of Willamette Valley Vineyards about the history of Oregon wine making. He should know, he’s been growing grapes in the Willamette Valley since 1983 and was keen enough to see the enormous potential of the region by naming his winery after the future appellation. Instant brand recognition. He informed us how Pinot Noir is well suited to the region because of the clay soils, long growing season, and cool climate. We also learned that Pinot Gris was grown first in Oregon before any other state. Finally we learned of Jim’s fondness for chocolate as we either bumped into him sampling the wares or spied him bringing bars back for his neighbors. Finally, we learned from Jim, the Redford’s from Amity Vineyards, and the other winemakers how Oregon is leading the nation in sustainable viticulture. Amity’s estate vineyard is certified by Low Input Viticulture and Enology, Inc. (LIVE) and produces the region’s first Organic, Sulfite-Free Pinot Noir. Willamette Valley Vineyard is the first winery in the world to use cork certified through the Rainforest Alliance to Forest Stewardship Council (FSC) standards – and we kept one to show others the FSC label. Resonance Vineyard was Biodynamic® certified in 2006 certified. We found, humorously, that sustainability is an everyday vocabulary word, as in, "Kim, you’re so sustainable". And here are a list of the sustainable Oregon wineries that poured this day: Adelsheim Vineyard, Amity Vineyards, Anne Amie Vineyards, A to Z Wineworks, Coelho Winery, Olsen Family Vineyards, Resonance Vineyard, Rex Hill Vineyards, Sokol Blosser Vineyards, Willamette Valley Vineyards. We next moved east to the contingent from New York where we wanted to try this year’s vintage of Finger Lake Riesling. To our surprise and pleasure we found that Rob, Finger Lakes Weekend Wino, was representing the region. We read his column regularly and suggest anyone traveling to this region do so as well before you leave. While tasting the New York made Riesling it was interesting to note the differences between the Oregon versions. The latter versions were slightly sweeter and more acidic, whereas the New York Riesling being poured seemed drier. This was probably more a result of the specific wines being poured and not anything resulting from the different appellations. Dr. Frank's consistently pours a great Reisling and Standing Stone Vineyards was also available to pour their Reisling and Gewurztraminer. We also tried for the first time Standing Stone’s Cailloux, a dessert wine made from eight different grapes. Some in our contingent liked it more than their Vidal Ice Wine. After spending some more time saying hello to our friends at the Virginia wineries and planning a trip to Tomahawk Mill Winery, we set out to try some California wines. There is always a large contingent of Lodi based wineries and in the past we had tasting excellent Zinfandel from Jessie's Grove Winery and JanKris Winery – so today we tried some new wines. One of the first were the excellent wines from Vino Con Brio. They had both excellent whites and reds, particularly their Old Vine Zinfandel. 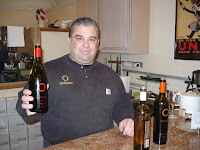 We kept hearing about Opolo Vineyards from several attendees so we had to see what the commotion was about. This central coast winery had large crowds around their booth and we saw why since they came with a large selection of wines and the entertaining representative kept the crowd laughing. We liked their reds, particularly the Fusion and Maestro blends. Another central coast winery where we spent a lot of time was Edward Sellers Vineyards, makers of Rhone styled wines. We liked their vintage Grenache and Syrah, but once again our favorites were the blends, the Vertigo (Grenache based) and Cuvee des Cinq (5 varieties of course). It was also interesting to learn how these Rhone grapes thrive in the hot central coast, since the nighttime temperatures plummet, cooling the grapes from the hot day. Other California wines we’d like to remember are Valley of the Moon Winery’s 2006 Pinot Blanc; Lake Sonoma Winery’s 2004 Alexander Valley Cabernet Sauvignon; Peltier Station’s Zinfandel; Chateau Julien Wine Estate’s Black Nova; Kiamie Wine Cellars 2005 Kiamie Kuvée; Spring Mountain Vineyard’s 2003 Elivette; and Donati Family Vineyard’s Pinot Blanc. That’s quite a list. In addition to the spirits that we tasted, Dogfish Brewery was pouring a few styles of beer, with the most interesting being their Chateau Jiahu. We’ll let Dogfish tell the story; but we drank their stand dry. Jiahu is not only unique – but it’s a good beer – similar to a cloudy wheat ale. For one of the first times we took a break from the drinking and actually browsed the venders. And there were actually some very practical accessories. VineyardFresh has always been one of our favorites since we seem to open many bottles and return a week later to an oxidized wine. Anything to preserve wines is useful. We also liked the Bottleneck Wine Cards – basically cards that fit on the wine’s neck when giving the bottle as a gift. Plus, they are cheaper than Hallmark. And our favorite food – for some reason either it was a great location next to the Dogfish stand or peanuts go with wine, but we returned often to sample and purchase the several styles sold by Belmont Peanuts. These are Virginia grown peanuts – just south of Richmond – and we argued incessantly which was better among their plain, barbecue, honey-roasted, and chocolate. I liked the plain and barbecue, but in any case – these large and meaty peanuts put the ballpark versions to shame. Even though these festivals seem a little pricy, the wide array of available wines and seminars make it worthwhile. Where else could you try a South African Pinotage, Spanish Muscat, Chilean Carmenere, Rhone Grenache, compare Horton’s and Dr. Frank’s Rhatiselli, not to mention the many wines we didn’t try. One of the better decisions I've made in the last few weeks was to attend "A Beginner's Blind Tasting with the Master/Master" seminar given by Doug Frost at the Washington D.C. Wine & Food Festival. I had had numerous email exchanges with Doug over the past few years concerning Midwestern wineries and Norton and tried to find a time to say hello during the weekend. Since he was very short on time - giving two seminars each day - I decided to forgo my usual drinking routine and attend a session. What an enlightening and entertaining class. First something about Doug. He is one of only a few individuals who are both a Master Sommelier and Master of Wine. He is also the author of several wine books, notably On Wine: A Master Sommelier and Master of Wine Tells All , is the director of the Jefferson Cup Invitational Wine Competition, judges numerous competitions, etc. Let's just say he's knowledgeable about the subject he teaches. The purpose of a blind tasting, according to Mr. Frost, is to remove any preconceived opinions about a wine or discriminating preferences toward a wine region. We all have biases and tasting blindly removes these as a factor in evaluating the wine. Then throughout the session, Doug informed us how to reduce the number of possible wines by the deduction method - that is, by analyzing the wine and deciding what it is not. Then, after you've narrowed the possibilities - you have a better chance of guessing the type of wine. Out of the seven wines we tasted we discovered how to notice when a wine's aroma changes with the taste - say, from a red cherry nose to a black cherry flavor. How to distinguish whether a wine has been aged in American or French Oak - or the gotcha when French Oak has a large buildup of tartaric crystals. Is the wine from the old or new world? Is the wine herbal, earthy, dusty; are there fruit or vegetable aromas? Sensations and questions I hadn't really thought about before the session. He also gave us the general characteristic of specific grapes - are they in general floral, spicy, herbal, fruity, etc. With this information we could eliminate most types of wines and narrow to a few possibilities - and at this point in our education - guess. Mr. Frost is also an outstanding speaker - blending humor and self-deprecation with his knowledge of wines and regions. He also encouraged the audience to evaluate a wine's purpose such as how a generally bland Italian wine comes to life when drunk during a meal. Or similarly, how a wine with a strong tannic finish changes with a meal. We learned that a Shiraz can be made that isn't overbearing and too spicy and that a zinfandel can be made to taste like a merlot or cab. At the end of the session the old adage surfaced - "the more you know, the more you realize you don't know". I have a lot to learn. But, I have an improved basis on how to evaluate a wine - and thus hopefully enjoy the experience a little more. If only I had time for his next presentation on "Rioja: Where Old Meets New - A Reserve Spanish Wine Seminar". Maybe next time. In our never ending quest for new and exotic spirits, the Washington D.C. International Wine & Food Festival delivered brilliantly with two spirits from neighboring South American countries. From Peru, we discovered pisco, a brandy made from grapes. If you've never heard of this spirit, don't be disappointed, Pisco Ku is the first pisco sold in the United States and has only been available for the past three weeks. This brandy is made from a blend of several indigenous grapes which means its made in the Acholado (Half-breed) style. Pisco made from a single grape variety is called Pure, whereas pisco made from the muscat grape is called Aromatic. Ten pounds of grapes are used to make a single bottle. The Pisco Ku is similar to grappa but without the tannic finish. That is because only the grape must is fermented; the stems and skins which are included in Italian and Chilean grappa must are removed. The result - a spirit that is extremely smooth like a good Vodka, but with a slight grapey flavor similar to grappa. Another interested note about pisco is that by Peruvian law, pisco must be made to proof in a single distillation - i.e. the fermenting grape juice must be distilled exactly at 40 proof the first time - no second or third distillations are permitted.Plus no additives may be added to the pisco that could alter its flavor, odor, appearance or, of course, alcoholic proof. Pisco Ku is marketing their brand as an alternative to Vodka - suggesting it as a mixer with orange juice, cranberry juice, or lemons. I think it's perfect neat or I plan to try it how I like my grappa, adding it to an espresso. The second discovery comes from neighboring Ecuador and is a brand of rum: Zhumir Seco Soave and Zhumir Aguardiente. Each brand is made from a different rum making style. The Seco Soave is made in the traditional fashion, by turning the sugar cane into molasses and then distilling the syrup. The Aguardiente is made by distilling the sugar cane juice directly and reminded me a little of cachaca. Even though neither are aged in wood - they are smooth and ready for sipping. The most popular brand on Saturday was their pre-mixed Zhumir Pina Colada and on Sunday their flavored Zhumir Limon - the Aguardiente mixed with lime juice. We went a step further with a few daring souls and mixed the Pina Colada with the neighboring Voyant Chai Cream Liqueur Liquor that we discovered in south beach the previous weekend. Now that was a cocktail. The next step is to determine if these brands are the best spirits Peru and Ecuador have to offer........possibly the Zhumir Reposado Reserva Especial or Zhumir Reposado.